That ability being the "Mist Form" or smoke cloud unique trait. 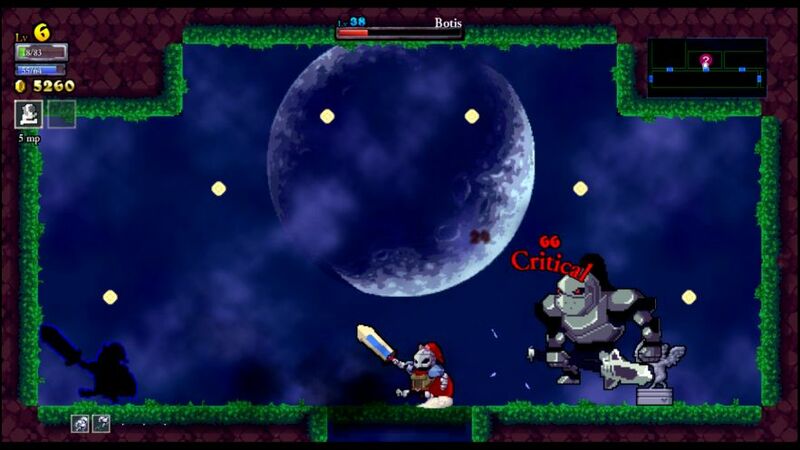 Hitting the special ability key causes the Assassin to become invisible to monsters and immune to nearly all damage (it doesn't work against floor spikes). There's an initial cost of 5 mana upon using this technique, and then it drains further magic points per second of use. Attacking or hitting the special key again will then cancel the mist cloud form; you can't deal damage while hiding in the smoke. Needless to say, the smoke cloud is an insanely useful skill to have at your disposal, and intelligent use of this resource is absolutely crucial to playing the class effectively. It has a bit of a high skill cap to use to its full potential as well; you can actually auto attack, dodge into the mist form for a split second, and then auto again, blinking in and out of invulnerability multiple times per second. The one real drawback is running out of mana, which can happen very fast at lower levels. The Assassin honestly needs to dump a bunch of upgrades into more maximum mana to get the full value from the class, yet another reason why it tends to dominate in extreme lategame. I would begin the game as a Knave, the unupgraded form of the Assassin class. You can't use the smoke cloud until unlocking the higher form of the class, something that I would try to do as quickly as possible. Let's get started! Sir Lee the Knight perished right out of the gate. However, his fertile loins produced an Assassin heir to kick off this run. Nostalgic, OCD. The washed-out brown screen is always a bit annoying, if not so bad as some of the other traits. I was struck (like every other time I go back to Normal difficulty) of the vastly lowered challenge level compared to the NG+ modes. All of these first-tier monsters were a cinch! I even managed to grab an early fairy chest rune by tossing the chakram to take out a group of enemies stuck behind a wall. Had a nice fight with a random tier-three zombie (Zombishnu) in a small room, fortunately managed to avoid getting hit. I was able to clear out nearly all of the castle, leaving only a "kill all monsters" fairy chest room, and unfortunately I met my demise in there. The relatively low health total of the Assassin made things a little bit rough, and I was only getting 7 health back per chicken, plus no Vampirism for sustain. Needed to upgrade from Knave to Assassin as well to unlock the smoke cloud ability. I found the Squire Chestplate and Knight Bracers on this initial run, with the latter one not being as useful for this melee class. I carefully planned out my upgrade gold here, taking the initial default stuff and pushing over to the right side in the general direction of Upgrade Knave. I made certain to take the default Sprint and Vault runes (that grant the double jump and dash), and then finally purchased the Squire Sword and Chestplate. This was a decent enough first run, but I thought it could have been better. No traits on this Knave, but she was the first one to have the class-unquie Quantum Translocator spell. This one puts down a little shadow clone at your position on the screen on first cast, and then on second cast, you teleport back to the initial spot. It seemed like a useful spell, if I could get some practice in using it, plus it only cost a dirt-cheap 5 MP per casting. The most early interesting fight was against a tier-three flying fire mage, where I did use the teleportation spell to dodge out of the way of the big fireballs. There was also a triple chicken drop in that room, which was highly appreciated. I won the dagger throwing minigame again with this character, which sadly resulted into the Blood Cape appearing. I hate the Blood stuff, I don't like anything that lowers your health (see: Lich run). Good news: I was able to grab two runes in the castle without much difficulty. Bad news: both of those runes were useless Grace Runes. I only took a single hit in the whole castle, and the net result was a whole bunch of random chicken drops that went to waste. That's a problem I don't mind having. I really could have used those chickens in the forest though, where the supply completely dried up. I had some fun battles in there, and made it through about a half-dozen rooms one hit away from death. 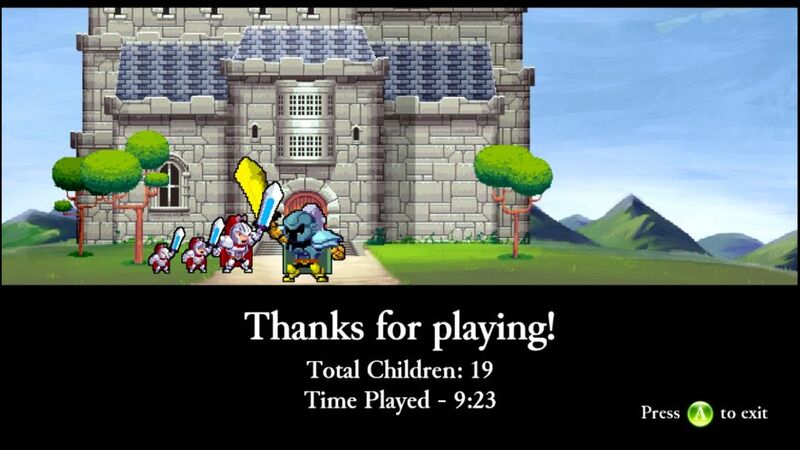 Towards the end, I fought Botis in a battle where any hits would spell my end, but I managed to emerge unscathed. The Sage Cape was a poor reward for victory. I fell eventually in a crowded room, trying to drop blindly down to a lower level for more space to fight, only to land on a blob. Ah well, it was a nice run nonetheless. I used the resulting gold to unlock my way over to the Assassin upgrade, then picked up two Gold Gain Up points and a Potion Up one as well. That left just enough to get the Architect and the Squire Helm. I had picked up some assorted Knight gear, which I would have to try and equip after the next run. This guy had no traits either. He was my first Assassin (not a Knave), and that opened up use of the amazing Mist Form ability. This lets you dodge into a smoke cloud where you are completely invincible from all damage, at the cost of being unable to deal any damage either. I got an early chance to use it against the duo flying mage minibosses in the castle. They hit me one time (taking away 38 HP from my total of 98 HP), and then dropped... the Blood Helm. Bah. One thing that I underestimated was the cost of using the smoke cloud ability. I only had 68 mana here at the start of the game, and just a few seconds of use would run my Assassin out. I had to be very judicious in hiding away, just popping into the darkness for a second or two. This particular run wasn't as good as I would have liked, it seemed as though I was running around one hit from death the whole time. Most of my damage came from traps or spiked balls, rarely from the actual monsters. Eventually I succumbed at the very end of the forest, nearly a full clear. I used the gold to take the second Potion upgrade (not having the 5k needed for the third Gold Gain upgrade), and then picked up the Silver Chestplate, the Knight Helm, and the equipment weight needed to put them on. Hypergonadism and OCD traits, super knock back and mana from destroying stuff. 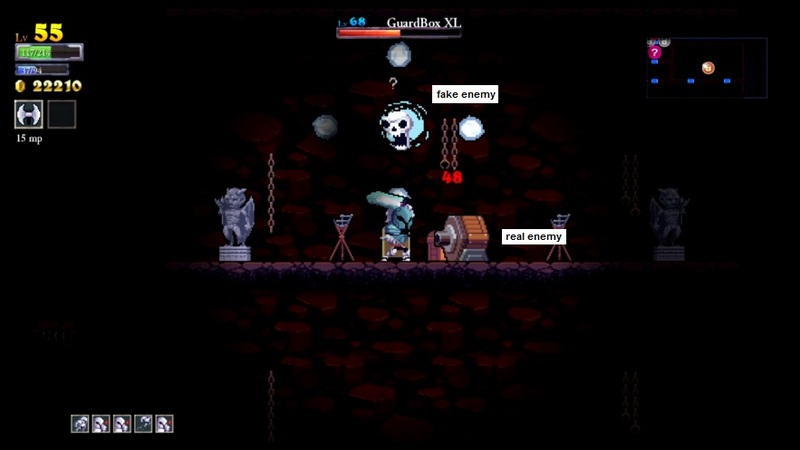 The first good battle that this Assassin faced was in another fairy chest "kill all enemies" room, where it was full of mostly the flying cloud enemies, including two of the third-tier ones (Infernites). I made it through there with one hit taken, and several uses of the Mist Form ability. The OCD trait allowed me to replenish mana from that encounter by breaking pots and candles, like having some free Siphon. I also won the axe-throwing minigame, only to land the Blood Bracers as a prize. The game seems to think that those pieces of equipment are good prizes, even though I think they're terrible. I took some hits at times in the castle, but never dropped below half health, and made it into the forest in good shape. I made it through nearly all of the forest with few problems, only to die in shocking fashion all at once. It was a room with skeleton bone throwers on an underground platform where they couldn't be reached, and two of them hit me at once, followed by a third-tier plant monster hitting me with green goo. And I was dead before I even knew what was happening, all of my life drained instantly, five unused chickens sitting at the teleports. That was a real bummer. I found all kinds of equipment on this run, and three or four runes, but none of them were very useful. Lots of Sage gear and yet another Grace Rune. I put nearly all of this money into the third Gold Gain upgrade, and then used the rest on some equipment. The Squire Cape (4% more crit chance) was particularly useful for my Assassin, taking me to 19% crit chance overall. Color Blindness and the dreaded Muscle Weakness trait, no knock back. I really hate that one, but this was the only Assassin available. I started out this run by going after one of those "take no damage" fairy chest rooms, one full of the ball-and-chain monsters that's nearly impossible to complete normally. I did get the chest by running through in smoke cloud form, only to find that I only had enough mana to make it to the chest itself. Then I had to run back out with no such advantage, and fell down to near-death status on the way. The rest of the castle was a slow process of recovering health and mana through drops. During this process, I found the entrance to the basement, and the basement boss door in the very first room, where the Ranger Sword appeared in a chest! That was a sweet pickup. I was knocked low on health several times in the forest, but I managed to struggle through with help of a lucky fountain refill and through raiding all of the saved up teleporter chickens. This was the first Assassin to clear the castle and forest, and make it several rooms into the tower. 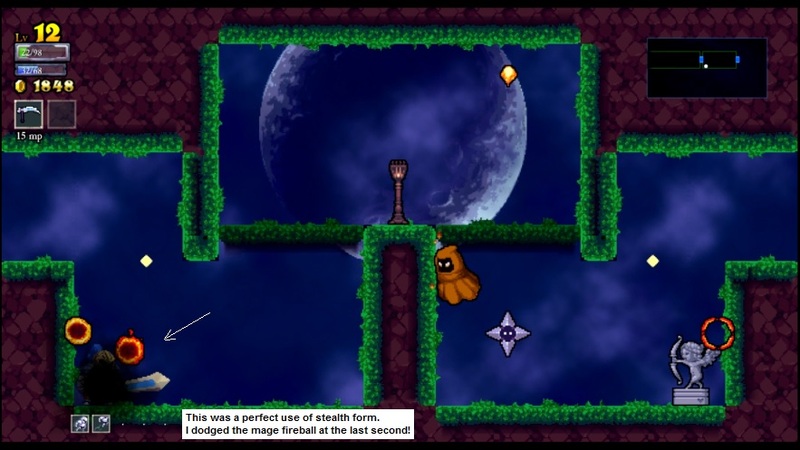 The lack of any knock back was a MAJOR problem on this run, and it made some of the flying enemies (mages, clouds, skull heads) virtually impossible to kill without taking damage. I grabbed several more runes, still no Vampire ones or even Balance ones as yet. Nearly all of my accumulated earnings went into the fourth Gold Gain upgrade, and I had exactly enough left over to pick up the Silver Helmet and the equipment weight needed to put it on. I had 0 gold remaining, nothing for Charon to take. Not this time, gatekeeper! I'd have to get the Ranger Sword (which was a major damage upgrade) next time. Coprolalia and PAD traits; the anti-spike PAD trait is probably my favorite in the whole game. This run went very smoothly all through the castle, I was getting a good number of chicken drops and not even needing them since I was sitting on full health the whole time. The most eventful thing was taking on Botis, who dropped only gold for a reward. The forest was also smooth sailing through calm waters, and I was able to pick up three more runes in there as well. There was a Plonky (third tier star-shaped shooting enemy) in one of the rooms, but I had no problem dispatching it. 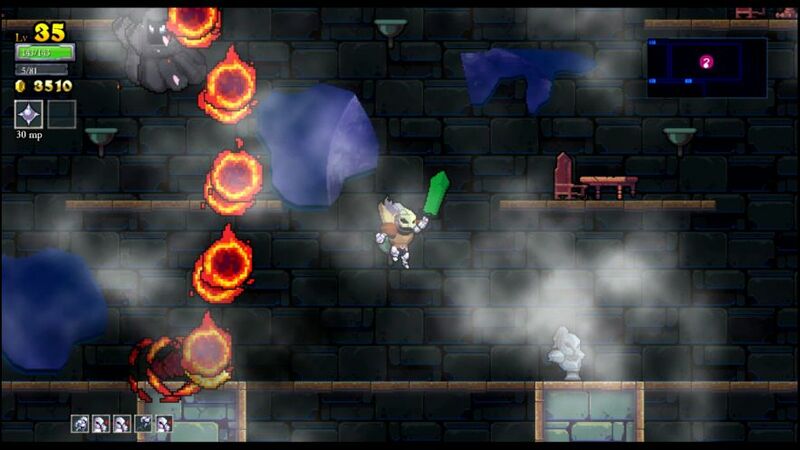 PAD trait allowed me to walk on the floor spikes in many rooms, greatly relieving the difficulty level. I might have made it far into the tower, except that I was hit twice in rapid succession in the third room and instantly killed. Two hits at 49 damage each were enough to wipe me out, I was slightly under my max HP cap of 109 HP. Hmmmpf. Looks like I needed more health, getting two-shotted was not much fun. Instead of buying more health though, I finished off the Gold Gain upgrades (only six Assassins needed!) 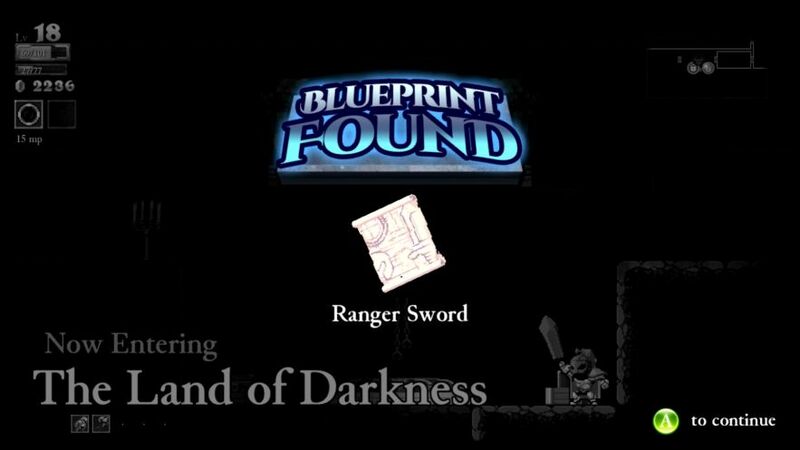 and put the remaining money into the Ranger Sword and the two unlocks needed to wield it. I had a mere 50 gold left after doing so - every coin counts. I was still waiting on a Vampire Rune to appear; I had 17 out of the 55 runes, but the Vampire ones were still being coy. I did have the option to get a Balance Rune for cheap pretend vampirism, which I would do if I had the gold next time. Gay and Savant, randomized spells. I got off to a rough start in the castle, falling down to just 10 HP at one point, and it looked like this was going to be a short and disappointing run. I was listening to the radio while playing, with the in-game music turned off, and I think that was a mistake. I don't do as well unless I give a game like this my full concentration. I switched off the radio and immediately started to do better, helped along by the presence of several random chicken drops and not one but two fountains along the way. The forest went significantly better, highlighted by another Botis duel where the big guy dropped a +5 health bonus. That was a lot nicer than the Blood Bracers or whatever! I made it through the whole forest, having the good fortune to find not one, not two, but THREE Vampire Runes along the way. Finally! Some kind of crazy luck there, none in the first six Assassins and then three almost in a row. They would be a huge upgrade after this run was over. I went into the tower next, only to see the run come to a close in about the third room... err, no, because I rolled a Death Defy and kept right on going! I had no points in the Death Defy skill, so this must have been the very minimal basic chance, whatever that is. (I've tried to find numbers on this and haven't discovered anything, but it's got to be extremely small.) Given a second life, I grabbed some more chickens along the way and actually made it through the whole tower, dying in the very final room in the back corner. So what looked like a poor run at first turned into 18k gold and a sweet haul of runes + treasures. I sunk the initial purchase money into two Potion Up points, and missed out by a mere 120 gold on getting the final upgrade there. (I had 7880 gold and it required 8000 gold.) Oh well, I'll finish it off next time. Then it took about 3000 gold to grab all of the runes that I wanted, picking up all three of those Vampire runes and I needed to get a Vault rune as well to preserve the double jump. 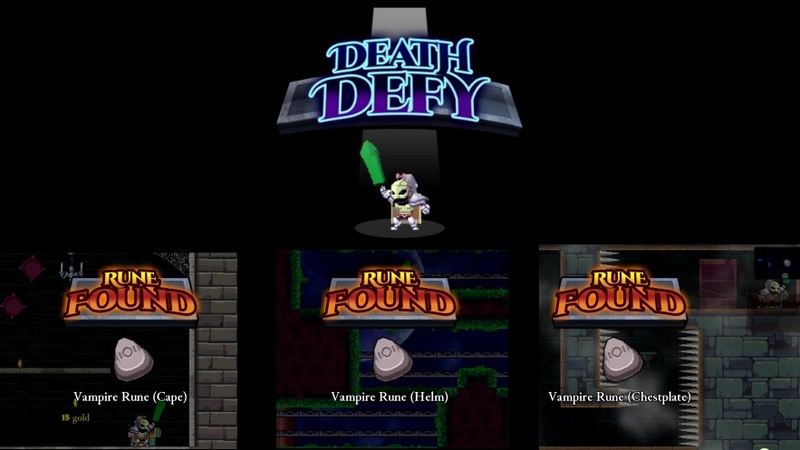 (One of the Vampire runes was in the same slot as the double jump.) I was now basically set on runes for the rest of the game, and went from no lifesteal whatsoever up to 6 health returned per kill. I expected that would make a gigantic difference. My Assassin had also picked up some gear upgrades, and I devoted more money into unlocking the Ranger Chestplate and the equipment point needed to put it on. I also found the Sky Helm, but didn't have enough cash to get that and more equipment weight. Instead, I sunk the final gold into unlocking my way over to the crit chance / crit damage upgrades on the tree, and then finally picking up three health upgrades. My future Assassins would be a heck of a lot stronger with all of these additions, and I still only had 4 points in health and 1 point in attack! Gigantism, Stereo Blindness. 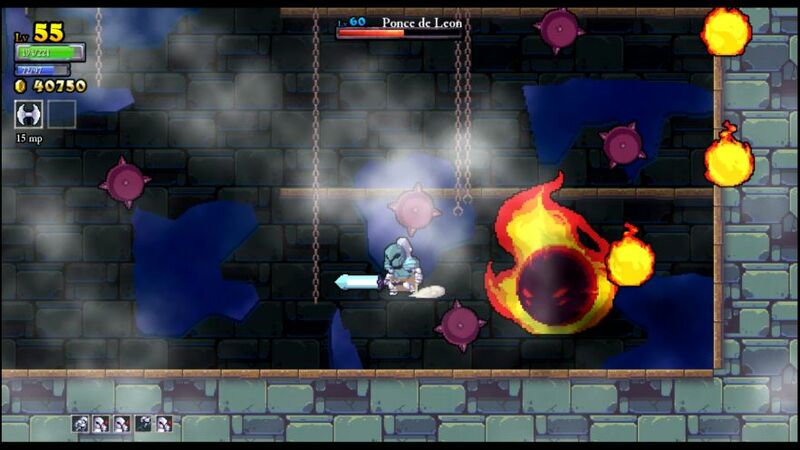 At least I had the smoke cloud to duck into when my huge character model was stuck in an unavoidable damage situation. I went immediately into the tower on this run so that I could go back and farm the easier castle for lifesteal fodder. This didn't work out, unfortunately, as I fought the duo flying mage miniboss in the tower almost immediately, and ended up dying to them. It wasn't my best effort; I had them both down to near-death status, but took a final hit before I could finish them off. Even I don't always come out ahead with these characters, I mess up sometimes too. The minimal gold went into some modest stat gains. 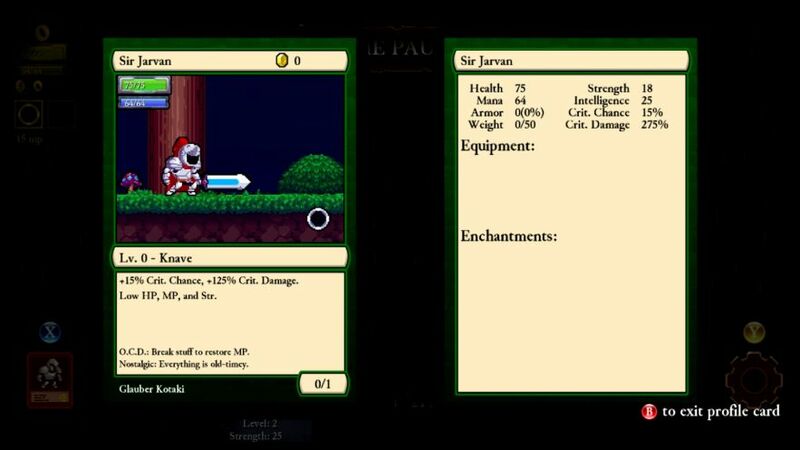 Savant, randomized spells. This run turned into the one that I should have had on the previous attempt. The castle portion of the dungeon was almost laughably easy now, and I used it as a place to recover health while venturing through the tower. I had a chance for redemption as the tower almost immediately served up another battle against the duo flying mages minibosses. This time the outcome was far different. I used the smoke cloud to perfection to dodge their projectiles, and managed to win without taking a single point of damage. They gave me a much-appreciated stat bonus to armor. 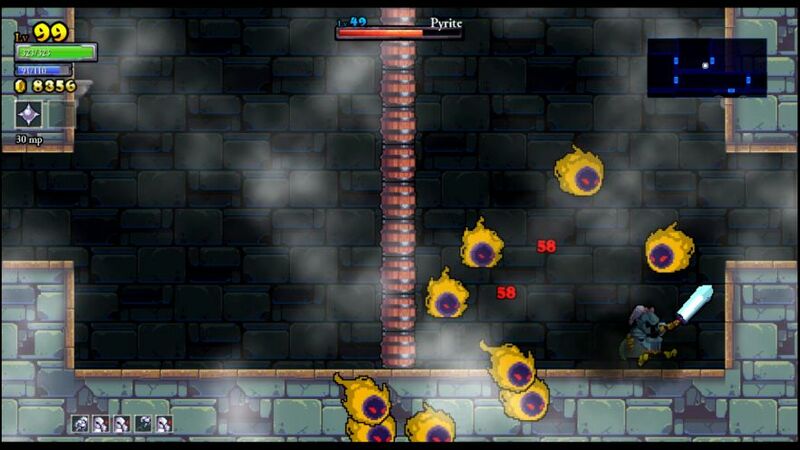 The rest of the tower was relatively easy, with a retreat once back into the castle to recover health. The forest was equally facile to pass through, easy enough that I went ahead and fought a Sallos painting at the end of it. That wasn't such a good decision, as I took a bunch of hits and limped out of there near-death without vanquishing the boss. Bad idea. There's a reason why I usually skip those things. With the castle, forest, and tower all cleared, I went ahead and fought Khidr. This was also a bit of a joke fight, as I was able to dodge more potential hits through use of the Assassin smoke cloud. With some practice, you can slip into mist form for about one second, just enough time to avoid taking any damage, and then phase right back into normal mode again. This seems to use roughly 15 mana if done quickly, which means that you can use it pretty frequently. Khidr didn't manage to hit me at all on this occasion. Down into the basement I went next, and I cleared out about half of it before dying. I might have been able to get the whole thing finished, except that I had to go teach a class, and I was running out of time, so I rushed through everything and didn't use all of my saved chickens. 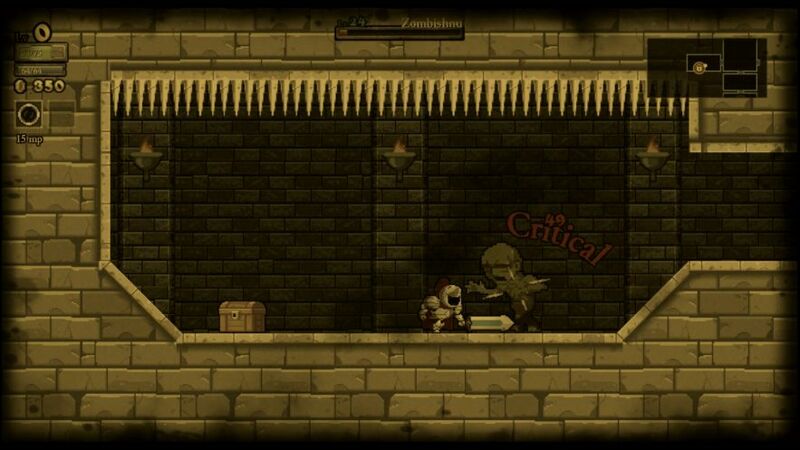 (I wonder what my students would think: "Sorry that I'm late, I was in the middle of a great Rogue Legacy character!" ) It was still a great Assassin run, bringing back 22k gold and a good haul of runes and equipment, most of it various types of "Sky" stuff. I purchased three of those items, four points of equipment weight, and then a whole ton of stat gains, twenty levels in total. I actually forgot to get the final Potion Up point, which I'd have to get next time. My Assassins got a LOT stronger. ADHD and Dementia, this Assassin was fast. He was also much more sturdy than past Assassins, as the 9 points I had put into health took me up over 200 HP. Maybe I should have done that earlier... I fought the duo skeletons in the castle and the duo mages in the tower, neither of which were able to hit me. Some more good uses of the smoke cloud in both cases. This was almost too easy, I was flying through every area with minimal danger. Even the tower presented fairly minimal challenge, as I was able to go outside to the castle and restore health whenever I took a few too many hits. Cleared out the whole place, and then went down into the basement next. Down there, in the darkness, was where I finally faced an appropriate challenge level. I had to make three or four retreats from the basement at times, going back to the castle and then the forest to rebuild health, as the monsters down there did a number on my Assassin. For all of my sustainability and strong offense, the fact remained that my character was very frail. Each hit would do 50-60 damage, and I had just over 200 HP. I ducked out of a bad situation one hit away from death on multiple occasions. Eventually I did clear everything out, landing a full dungeon clear for the first time on my 10th Assassin character. One other thing that made this run interesting was the Dementia trait, which makes your character insane and see enemies that aren't really there. This is kind of easy to spot when you run into monsters that are obviously misplaced, but it can still cause real problems dodging fake projectiles and struggling to tell what's actually there. Nevertheless, I picked up six more runes on this run along with some additional new weapons and armor. 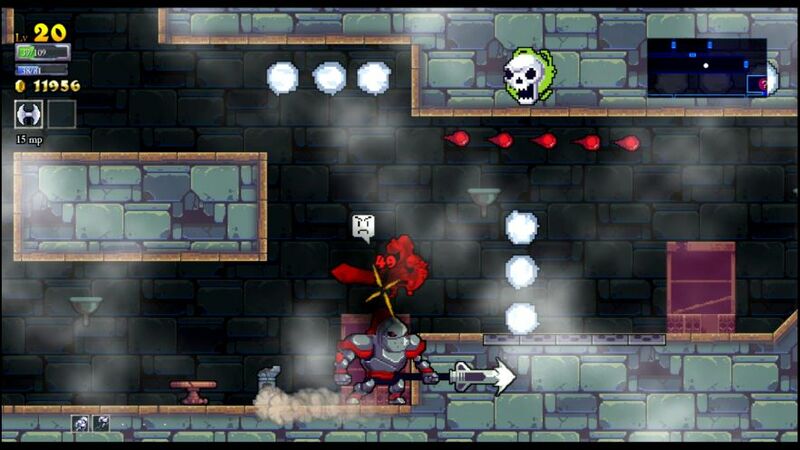 With the dungeon fully cleared, it was time for boss rush mode. I went up against Alexander first, and had no problems winning despite a lack of any area-of-effect spells or abilities. The flying skull heads could be taken out in two hits each, restoring 6 HP per kill in the process, and I slowly grinded down the boss while staying ahead of the curve. On the few occasions where I did get swarmed, I ran out of the situation using the smoke cloud. This was an easy victory; I took two hits, but lifesteal had me sitting on full health at the end of the fight. From there, I went on and faced Herodotus next, thinking that my Vampirism would make that an easier battle than Ponce. This may have been the wrong calculation, as my non-crit damage was still quite low. 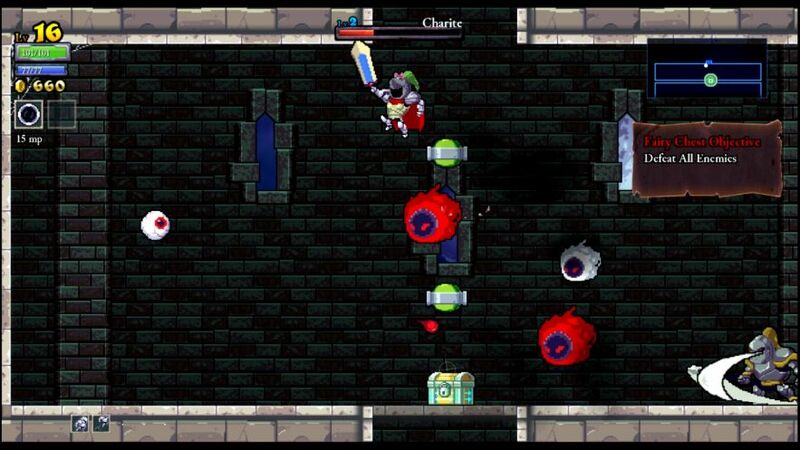 It took four hits to kill each blob, and that meant a lot of swinging to cut the boss down to size! Fortunately I played a very strong battle, taking hits here and there but staying as safe as possible. I dropped down as low as 30 HP at one point towards the end of the fight, putting me one hit away from death, only to dodge any fatal blows and narrowly escape with victory in hand. Whew. That took some doing. The Ponce de Leon battle was frankly an anti-climax after that, albeit one still fraught with danger. I played perhaps my best Ponce duel yet, dodging everything that he threw at me and escaping completely unscathed. Not a single point of damage taken, with kudos given to the Assassin's smoke cloud form again for some close saves. That left only the final two bosses, which I was dubious about being able to defeat at only Level 55. I was right to be skeptical, as Johannes picked me apart with relative ease. He only had to hit me four times to kill me, while I was barely scratching him. Looks like I needed more health and more damage to win that fight (that or be a better duelest). I used the large gold total brought back to finally get that last Potion upgrade, pick up the Ranger Cape (more critical strike damage), and then get a boatload of stat upgrades spread out amongst health, damage, crit chance, and armor. It totalled out to 29 additional levels by the time I was done, quite a sweet haul! EDS trait, another non-eventful one. This was another fairly uninteresting character run; the dungeon was never going to be a problem, and it was all going to come down to the final boss fight again. Some of the highlights included a weird battle with nine Pyrites (flying cloud enemies) in one room in the tower, which was all sorts of craziness and made for a good picture. I also found Calypso's Compass once again in the forest, the hidden room granting the Imperial Sword (plus the completely useless Sage Chestplate - one out of two isn't bad). I had the spare health to face off against a Sallos painting down in the basement, which I did defeat at the cost of most of my healthbar. I think I've sort of got a pattern down now to avoid taking lots of damage, but it will require more practice and more testing. The trick seems to be getting Sallos to fly in a slow circle around you, which is easier said than done. Eventually it was all gone and I faced the bosses again. I did pretty well against Johannes, losing about half of my health before dispatching him. The Fountain was another story, however. 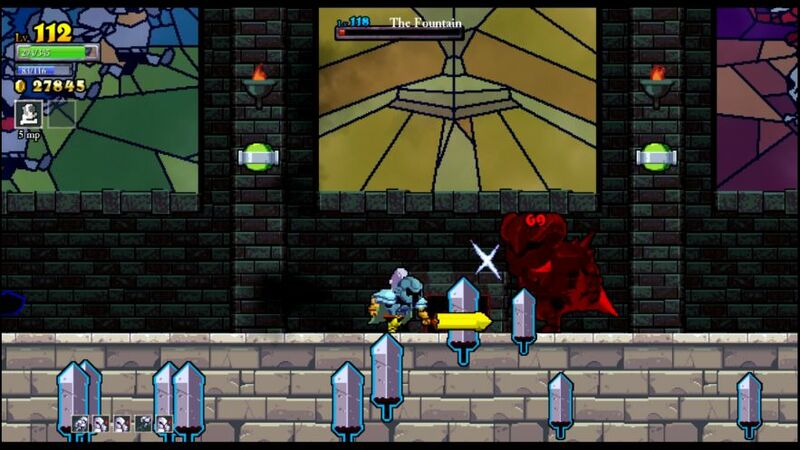 He threw out the sword projectiles over and over again, while I simply failed to execute well enough. Poor performance from me, and now I had to run through the whole darned dungeon AGAIN. Jesus Christ. This was getting embarassing. The only good thing was my accumulation of nine runes on this run, which might be my best ever. The Assassin can pretty much always get the "take no damage" runes by using the smoke cloud, so I found myself collecting lots of them. More gear and stat upgrades, repeat and try again. Endomorph, can't be knocked back. This run also was pretty low on excitement, since the Normal dungeon couldn't challenge my Assassin anymore. Amazingly I found Calypso's Compass for the third time in a row! This time the secret door was in the tower, and it gave me the Guardian Chestplate as a piece of useful gear. Very nice, I would put that on after the run was over. Otherwise there wasn't much to say about this character's journey, I cleared out the full dungeon and picked up five runes along with the usual ~30k gold. It was always going to come down to the bosses and how I managed the battle against them. 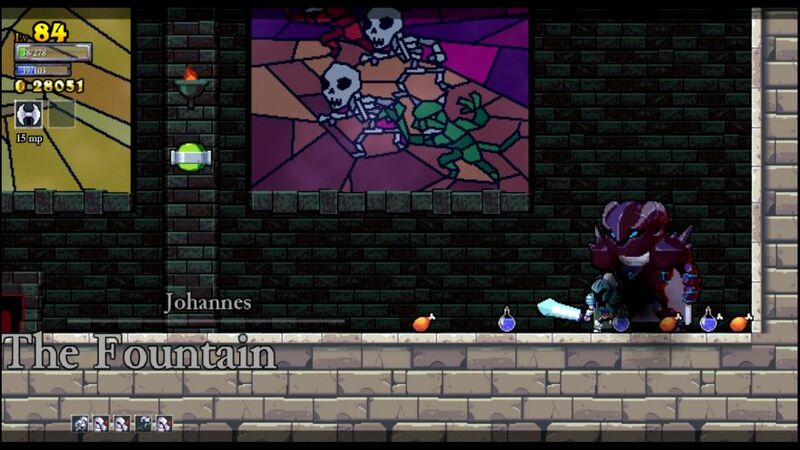 Johannes was first, and for whatever reason I played this fight almost perfectly. I knocked him back when he got close and otherwise dodged all of his stuff, using the smoke cloud once or twice as necessary. He hit me one time, and only because I saw that Johannes was on a sliver of health, and tried to finish him off with a dagger toss... only to realize that I had traded in the dagger for the quantum translocator earlier in the castle. Whoops. Didn't matter though, and Johannes died on the next sword swing. The Fountain duel similarly went a lot better this time, as he did his ground-stab attack several times and gave me opportunities to get in free shots. It also helped a ton that I had all four chickens from the Johannes fight sitting around waiting to be used as needed against the Fountain. In any case, I never got low this time, and won without too much trouble. Finally I could get out of boring Normal difficulty! The Assassin had proven to be plenty strong here in Normal difficulty. Although I had worried before the start of the run that it might be tough going in the beginning before the crit stuff began to ramp up, that simply wasn't the case. It was only my own failure to execute the final battles properly that prevented me from clearing Normal difficulty even sooner than I did. This was clearly a very strong class, and one that felt practically godlike in the wake of the Lich. The question at this point was just how far I could push things as I ventured into New Game Plus difficulty... and beyond.